Seeking to Educate a Generation of People about New York State Pavilion. East Northport, NY - February 4th, 2014 - On January 25, 2014, Aquarela Pictures launched a Kickstarter campaign, to secure $10,000 needed to obtain rights to archival footage, music, editing, and other costs associated with the completion for its documentary film, MODERN RUIN: A World's Fair Pavilion. Within the first ten days the Director Matthew Silva has realized his original goal of $10,000, and has set a new reach goal of $30,000 which will fund production costs for the entire film. The film tells the story of the New York State Pavilion, designed by renowned architect Philip Johnson, during the glory days of the 1964-1965 World’s Fair, and chronicles its demise over the past fifty years. It documents what the iconic structure symbolized at the 1964-65 World’s Fair, and preserves many of the fascinating stories that are woven into the fabric of the building’s history. It details the post-fair use of the Pavilion’s Tent Of Tomorrow as a 1960’s concert venue hosting some of the greatest musicians of the 20th century - The Grateful Dead, Led Zeppelin, Fleetwood Mac, Santana, and in the 1970’s as a roller rink. The film also includes the growing advocacy and support for the adaptive reuse of the structure that has been growing over the last several years. Since February of 2013, filmmaker, Matthew Silva, has conducted almost 2 dozen interviews with authors, historians, architects, architectural critics, fair goers, post-fair concert goers, the operators of the roller skating rink and many more interesting individuals. “Working on this film has been an incredible experience due largely to the overwhelming support I have received over the past year. The film is truly the product of a community effort and the generosity of many who are passionate about learning more about this building and seeing it put back to good use”, says Silva. It is Silva’s hope that this project will be the first step in engaging and informing people, to get them talking about the building in new and exciting ways. In the end, the goal is to contribute to the effort in re-imagining Flushing Meadows Corona Park and eventually lead to the repurposing of this great icon. This whimsical, futuristic, and soaring structure, constructed for the 1964-1965 fair, has been left abandoned for the greater part of 50 years. The dreamers see beyond the cracks, rust, and neglect to a thriving community space that will serve New Yorkers for generations, it would be a shame to have its story end in its destruction. Aquarela Pictures was founded by filmmaker, Matthew Silva, a middle/high school video production teacher with a passion for design, architecture, and preservation (among many other things). After studying Technology education at SUNY Oswego, Silva received his Master's degree in Liberal Arts at SUNY Stony Brook with a concentration in design education and design thinking. He also studied architecture at the Academy of Art University in San Francisco. Silva is a believer in design and its power to change communities, politics, the environment, and the world. In 2013 Silva help to found the advocacy group in support of the adaptive re-use of the New York State Pavilion, People for the Pavilion. For more information on this organization please visit www.nyspavilion.org. Modern Ruin: Kickstarter from Matthew Silva on Vimeo. 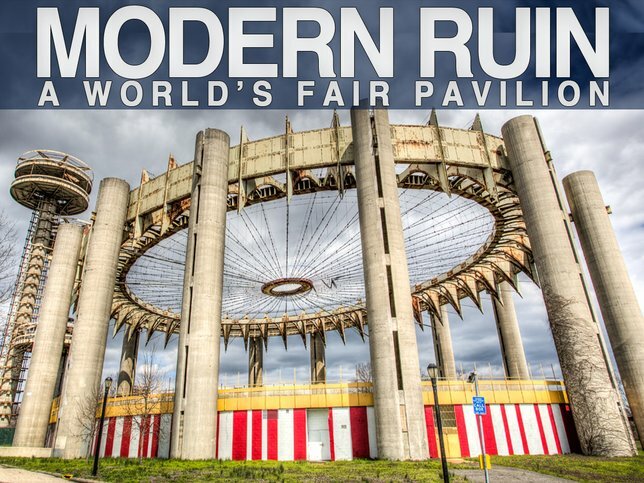 Subject: LongIsland.com - Your Name sent you Article details of "Long Island Filmmaker Announces Kickstarter for Film, Modern Ruin: A World’s Fair Pavilion"